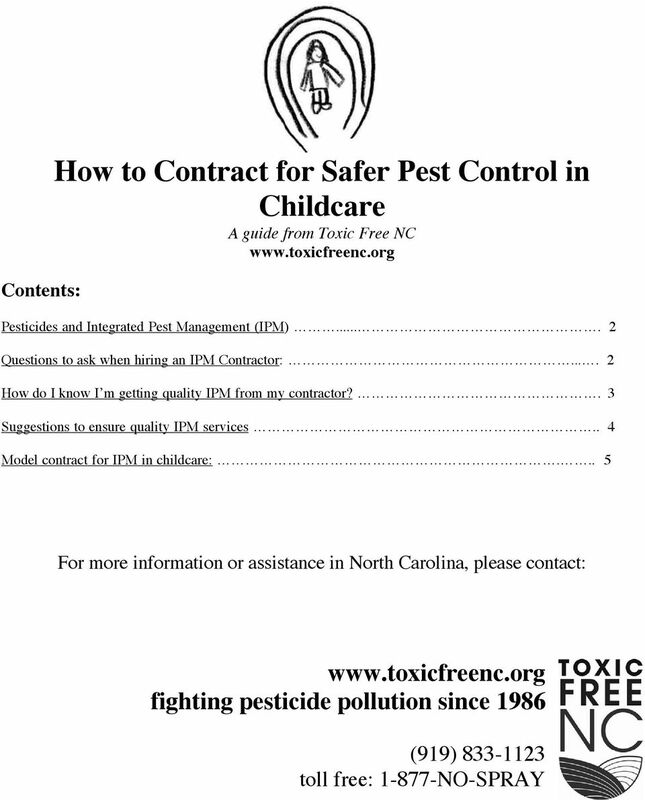 Download "How to Contract for Safer Pest Control in Childcare A guide from Toxic Free NC www.toxicfreenc.org"
2 Pesticides are poisonous chemicals that, even when used correctly, can trigger asthma attacks and increase the risk of serious health conditions in childhood or later in life. Children are even more sensitive to health damage from exposure to pesticides than adults are, because their bodies are smaller and still growing and developing. Integrated Pest Management (IPM) means cost-effective pest management without relying on hazardous pesticides. It is the preferred system for pest control in childcare and other sensitive environments because it uses little or no pesticides. 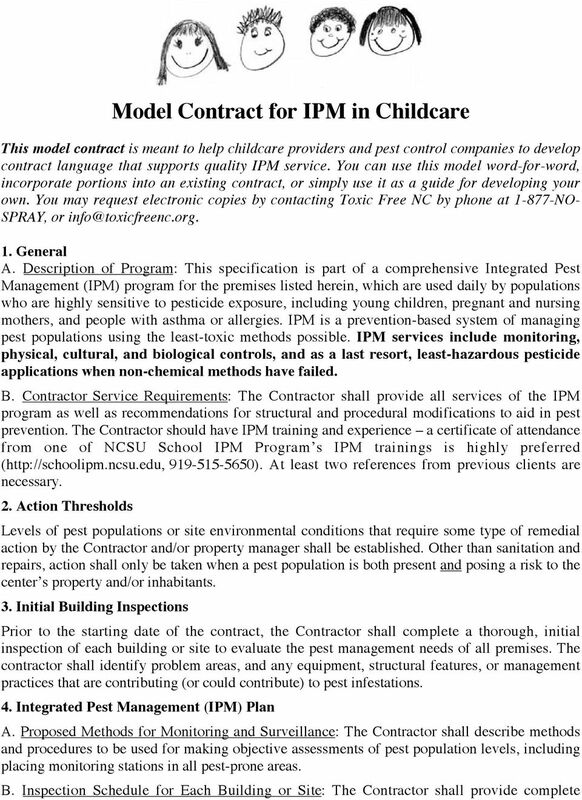 This guide is meant to help childcare providers hire an IPM contractor and work with the contractor to ensure quality IPM services. QUESTIONS TO ASK WHEN HIRING A PEST CONTROL CONTRACTOR: 1. Do you offer IPM? Shop around. Call several companies to compare their pest management services and costs. Introduce yourself and explain your interest in safer, more effective pest control through Integrated Pest Management. 2. 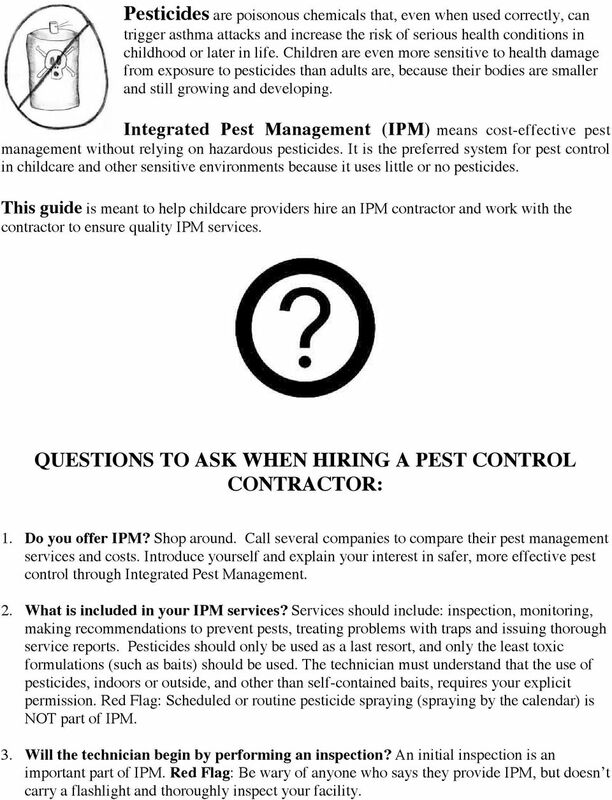 What is included in your IPM services? Services should include: inspection, monitoring, making recommendations to prevent pests, treating problems with traps and issuing thorough service reports. Pesticides should only be used as a last resort, and only the least toxic formulations (such as baits) should be used. The technician must understand that the use of pesticides, indoors or outside, and other than self-contained baits, requires your explicit permission. Red Flag: Scheduled or routine pesticide spraying (spraying by the calendar) is NOT part of IPM. 3. Will the technician begin by performing an inspection? An initial inspection is an important part of IPM. Red Flag: Be wary of anyone who says they provide IPM, but doesn t carry a flashlight and thoroughly inspect your facility. 3 4. Can you describe for me how you would handle a cockroach problem? While there are many ways to answer this question, the ideal response would include: identifying the cockroach species and figuring out where they re living and how they re getting inside; looking into sanitation & water issues and making recommendations for getting rid of the roaches food, water and shelter sources; and finally removing the roaches themselves. Options include using the Little Hummer vacuum, using a gel bait or self-contained bait station to get rid of a stubborn problem. Red Flag: Pesticide spraying should never be used in a childcare setting except under emergency circumstances, such as for stinging insects that can cause allergic reactions. 5. Will I receive service reports of your work and recommendations? Service reports and IPM Recommendations will help you prevent pest problems into the future by removing pests access to food, water, and shelter, and identifying any other conditions that may be causing pest problems. 6. May I call your other IPM customers for a recommendation? Don t be shy, call their references and make sure their IPM customers are happy. 7. Finally, use an IPM contract. 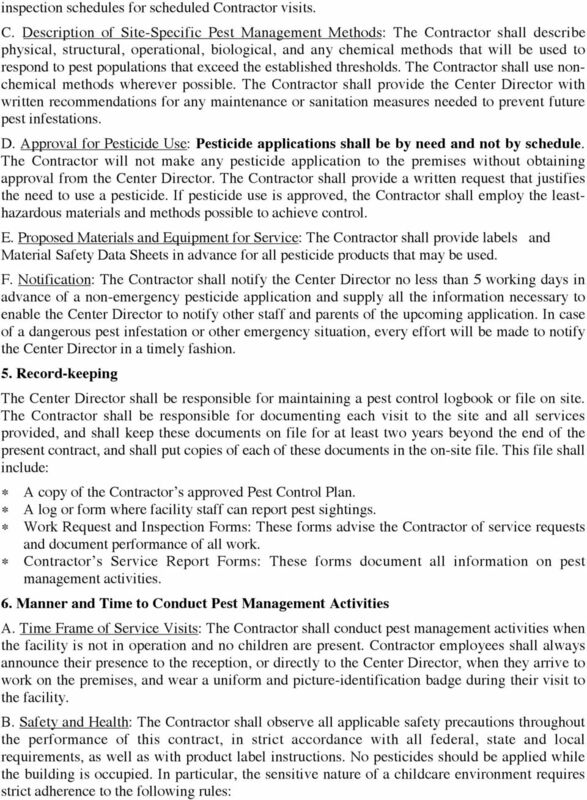 If you sign a contract for ongoing pest control service, be sure the contract calls for IPM. How do I know I m getting quality IPM from my contractor? Take this short quiz: 1. Are baits and traps used instead of pesticide sprays? Are these methods used ONLY when pests are detected? 2. Does your pest control technician monitor pest activity so that there are no big pest surprises? 3. Does your pest control technician provide suggestions to prevent future pest problems? If you answered YES to all of these questions, then it is likely you are receiving quality IPM services. If not, or if you re not sure, review service reports and discuss them with your technician. If you still can t answer YES to all the above questions, you may need to find a different contractor! 4 Suggestions to ensure quality IPM services: 1. Be there. Schedule pest management services when your staff is present, but preferably when children are not. You need to know what your technician is doing, and talk to her or him about recommendations for preventing pests. She or he should not be spraying pesticides or using other hazardous products except in emergencies, so there should be no need for your staff to leave the premises during a visit. If pesticides will be sprayed at your facility, be sure it is at a time when children and staff are not present, get all the information about what the chemical is and how to prevent exposure, and then notify all staff and parents in advance so they can take precautions to prevent exposure to the pesticide residues. 2. Use a pest sighting log. A list of pest sightings, including location, date and number of pests, will help your technician locate problems and solve them more efficiently. For a sample log, call PESTed at NO-SPRAY, or write to 3. Ask for service reports. A service report during each visit should detail the technician s inspection, describe evidence of pests (including those found in monitoring traps) and list traps or any pesticides used (including how much and where). A service report should also describe whether a pest problem is getting better or worse. Review the reports and keep them on file in the same place with your pest sighting logs. 4. Ask for IPM recommendations. A good technician will give advice for managing and maintaining your facility to reduce pest problems. This advice may include using caulk to seal up cracks, cleaning behind the refrigerator, installing door sweeps or getting rid of clutter. Follow their advice and keep IPM recommendations on file as well. 5. Adopt an IPM Policy. If you maintain a book of standard operating procedures then adopt an IPM policy. 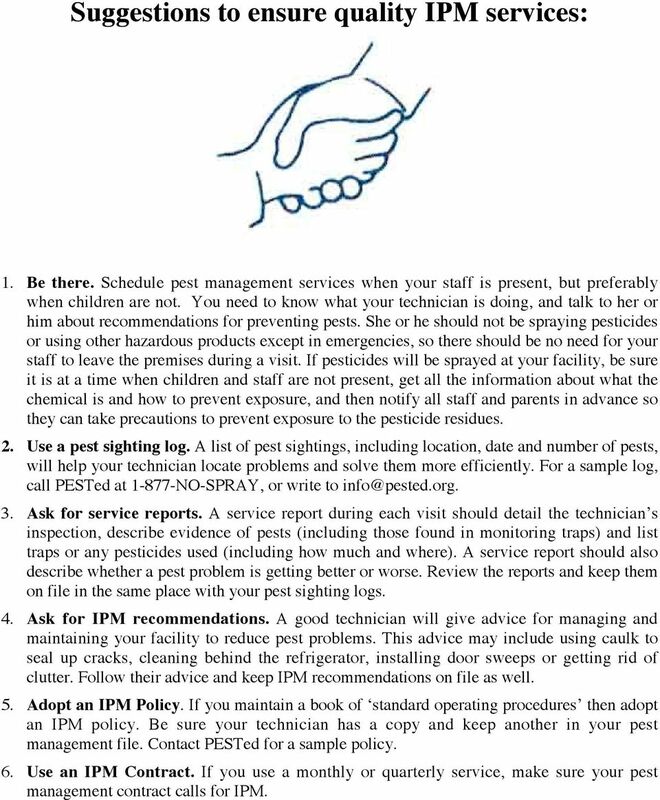 Be sure your technician has a copy and keep another in your pest management file. Contact PESTed for a sample policy. 6. Use an IPM Contract. 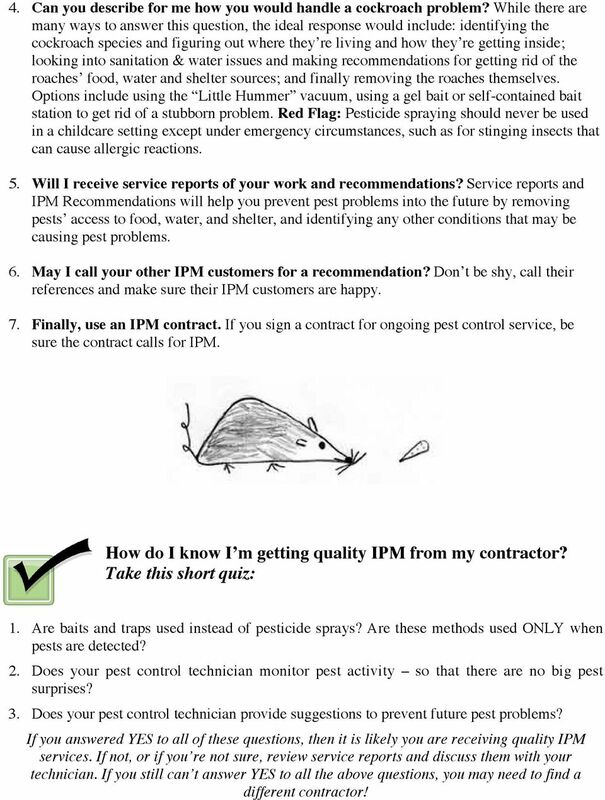 If you use a monthly or quarterly service, make sure your pest management contract calls for IPM. 7 Service technician s kits or other pest controls supplies shall not be left where children, pets, or any unauthorized person might remove, contact, or consume the contents (02 NCAC , NC Structural Pest Control Law). All materials and equipment for food preparation, health care, hygiene, education or play (food stuffs, cooking equipment, toys, books, medicines, towels, outdoor play equipment, etc.) must be covered or removed before pesticide applications in the same room or outdoor area (02 NCAC , NC Structural Pest Control Law). MANAGEMENT INTEGRATED PEST IN SCHOOLS/CHILDCARES. 4611 N. Ravenswood, Chicago, IL 60640 773.878.7378 www.midwestpesticideaction. Moscha Koronias, CPM CBRE Real Estate Manager. 4100 North Fairfax Drive Suite 720 Arlington, VA 22203 703 907 4100 Tel 703 907 4101 Fax. THE CLATTERBRIDGE CANCER CENTRE NHS FOUNDATION TRUST INFECTION CONTROL POLICY PEST CONTROL. DOCUMENT REF: PICGPESTC (Version No: 1.